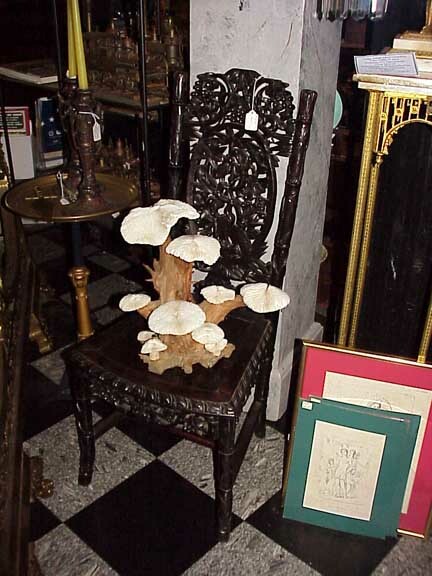 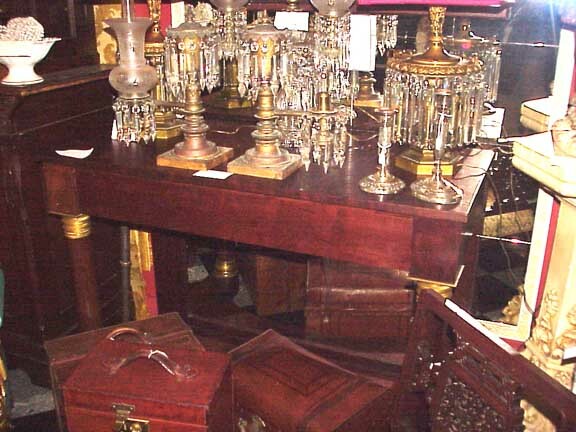 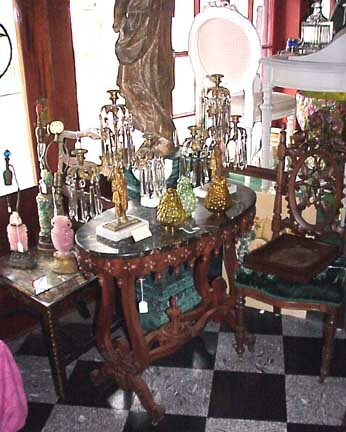 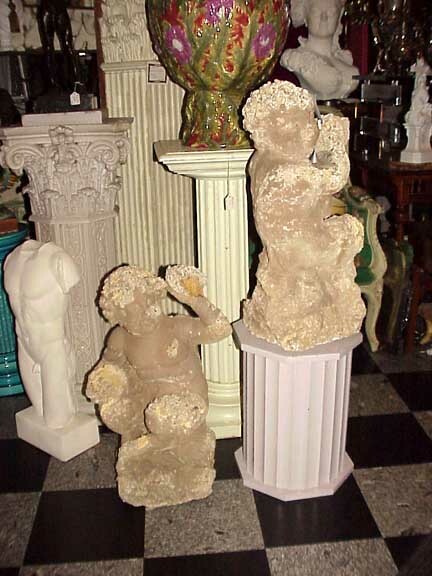 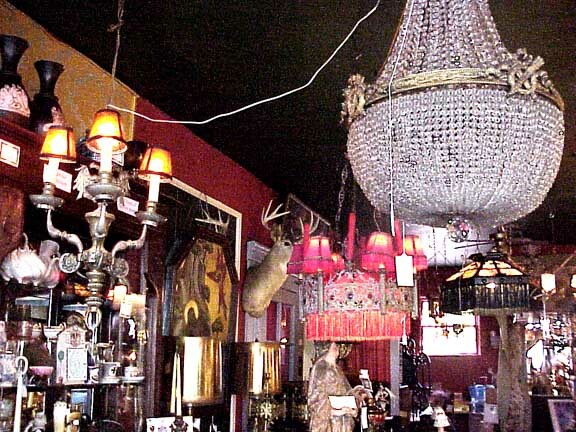 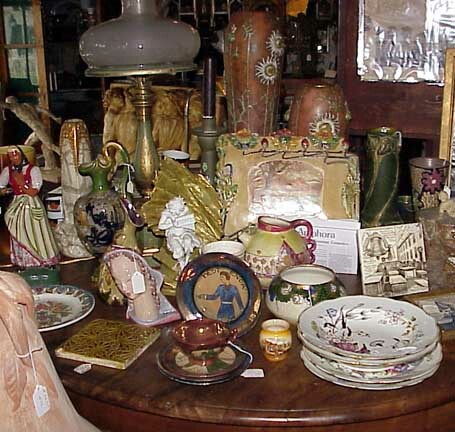 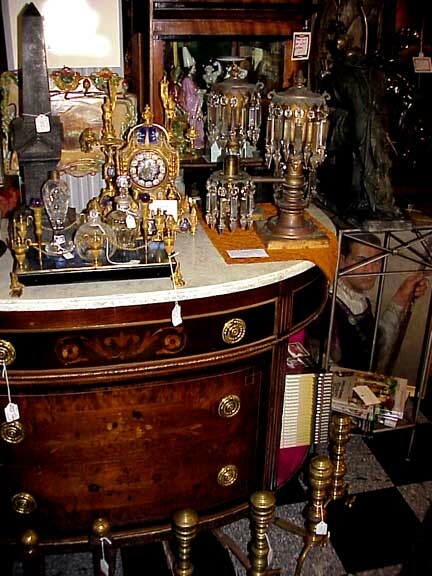 The images below were taken prior to October 15, 2007 and some of the items may have been sold. 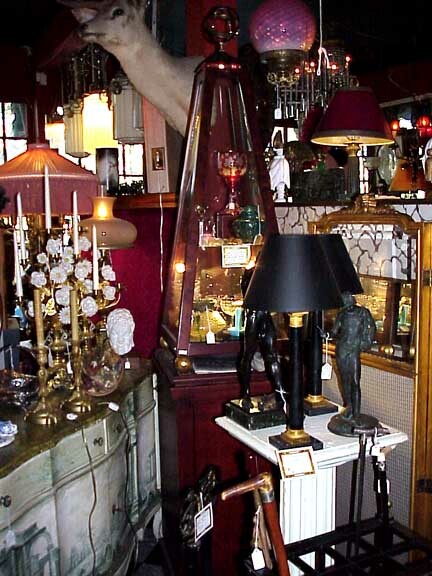 We also inventory retro-1930's, 1940's and 1950's decorative arts, especially lighting designed by Jere among others. 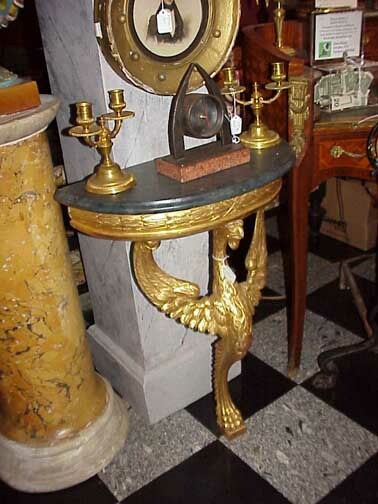 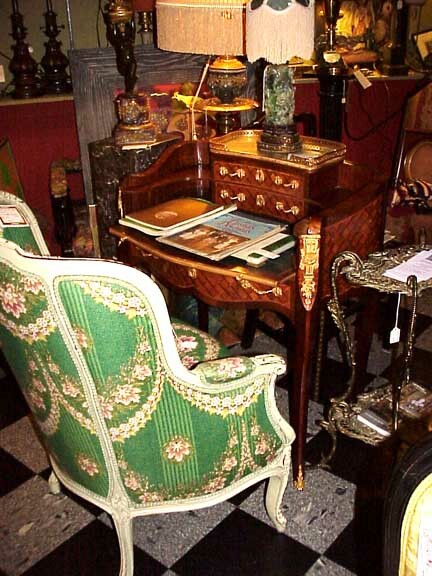 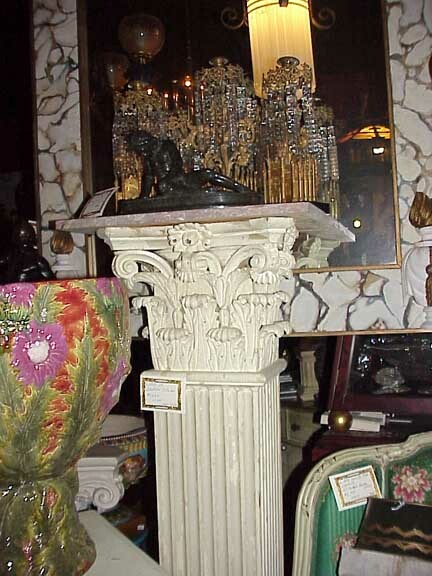 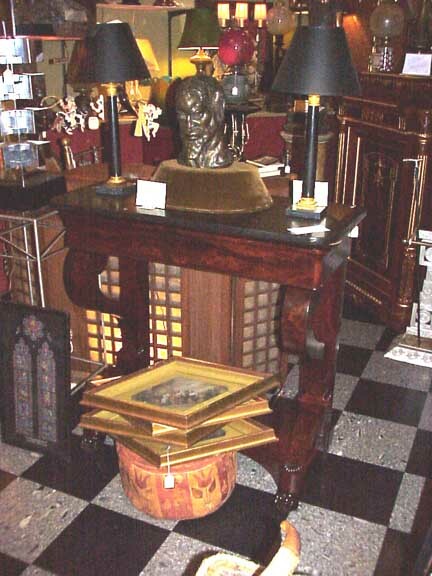 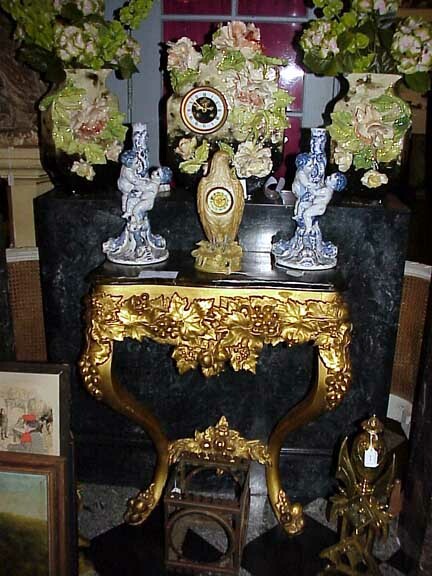 The small console table is probably Austrian and is carved wood, the pedestal on the left is Scagliola and dates from the mid-19th century and is probably Italian. 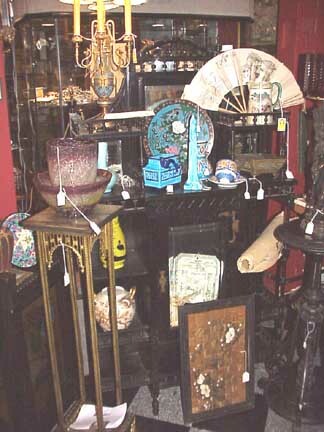 We do not have many oriental items. 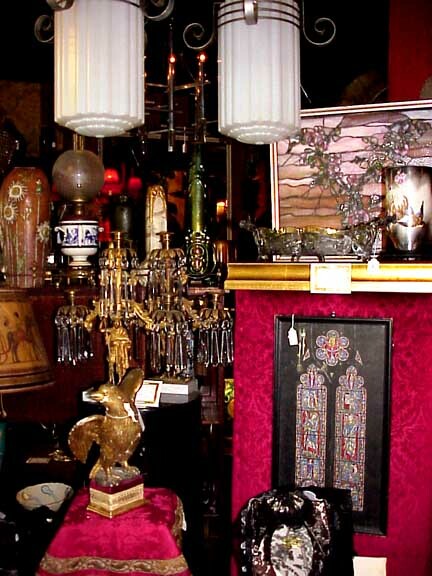 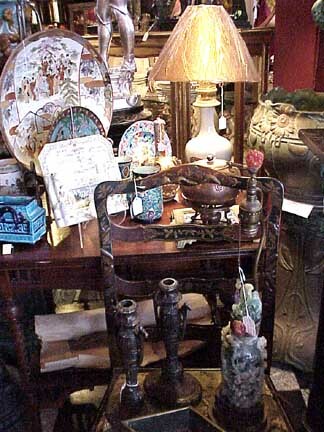 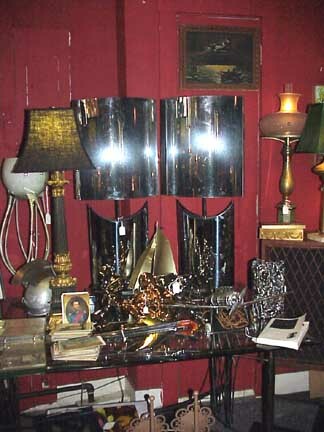 Pictured are a few items: lamps, chargers and vases. 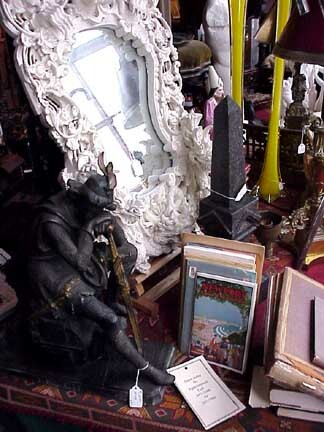 The large white metal figure on the left is titled "El Cid" and dates from the 1880's. 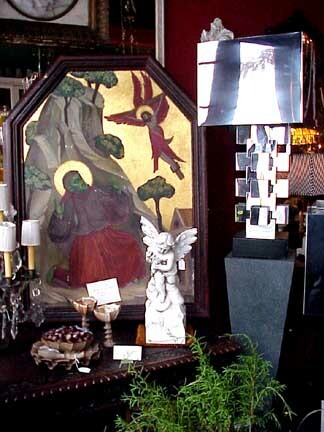 The large religious panel on wood is after Giotto and is St. Francis receiving the stigmata, the surface is gold leaf on gesso and polychromed. 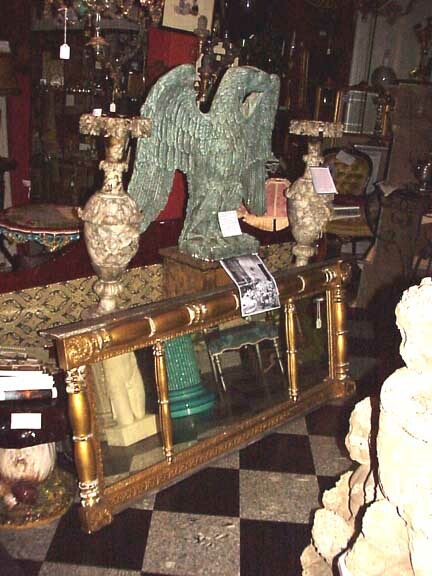 There is a label from the Fogg Museum attached to the back. 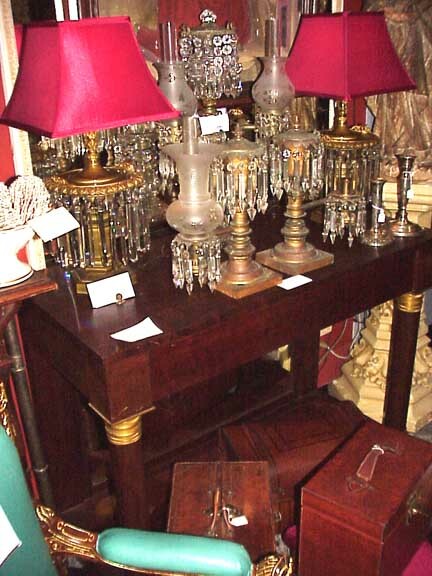 We believe that this picture dates from sometime in the 19th century. 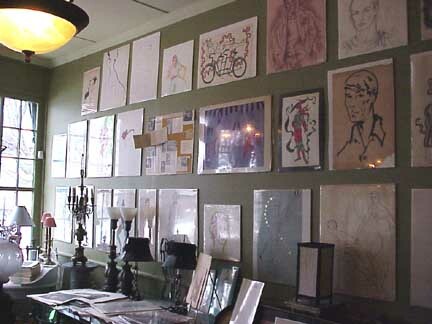 Showing a wall of art (original drawings)on paper, most dating from the 20th century. 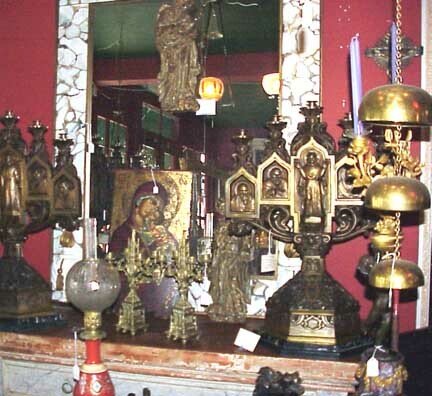 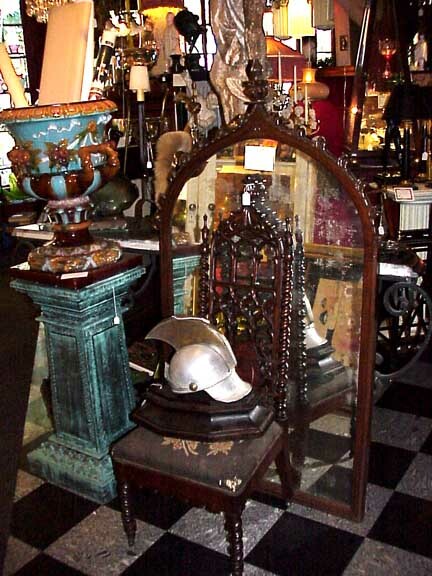 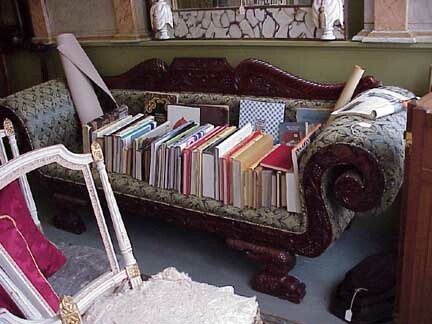 We always have many books about antiques in our gallery for sale. 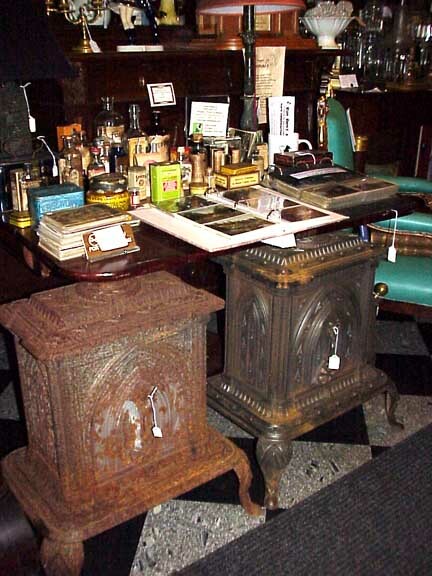 The American Gothic table has an original Egyptian Marble top and dates from the mid-19th century. 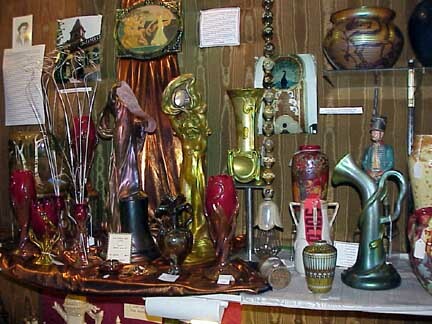 A selection of Art Nouveau Zsolnay Ceramics: we offer the largest selecton of antique Zsolnay in the United States for sale at any one point in time. 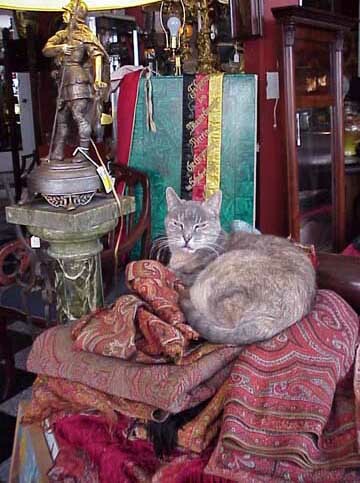 Kitty waits for the next 'customer' to pay attention to her!